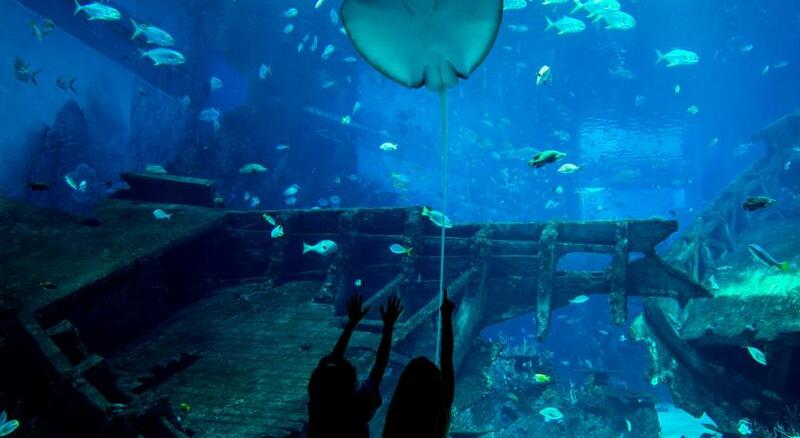 Lock in a great price for Resorts World Sentosa - Equarius Hotel – rated 8.5 by recent guests! I very like water dispenser. 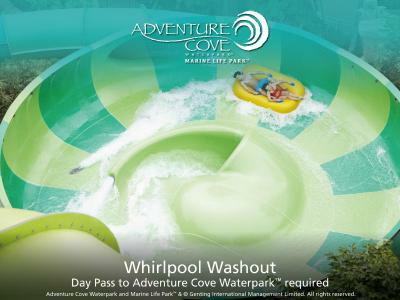 Very convenient to enter to water cove. Everything was great. The bathroom was spacious and the tub was comfortable. Room toilets, jacuzzi and Aquarium View were the Best! Car park very spacious! All Hotel staffs very friendly, helpful and courteous. Beautiful, large, comfortable room. Helpful staff. The room and bathroom are huge and spacious. Loved the bathtub! Well-maintained and clean. Resorts World Sentosa - Equarius Hotel This rating is a reflection of how the property compares to the industry standard when it comes to price, facilities and services available. It's based on a self-evaluation by the property. Use this rating to help choose your stay! 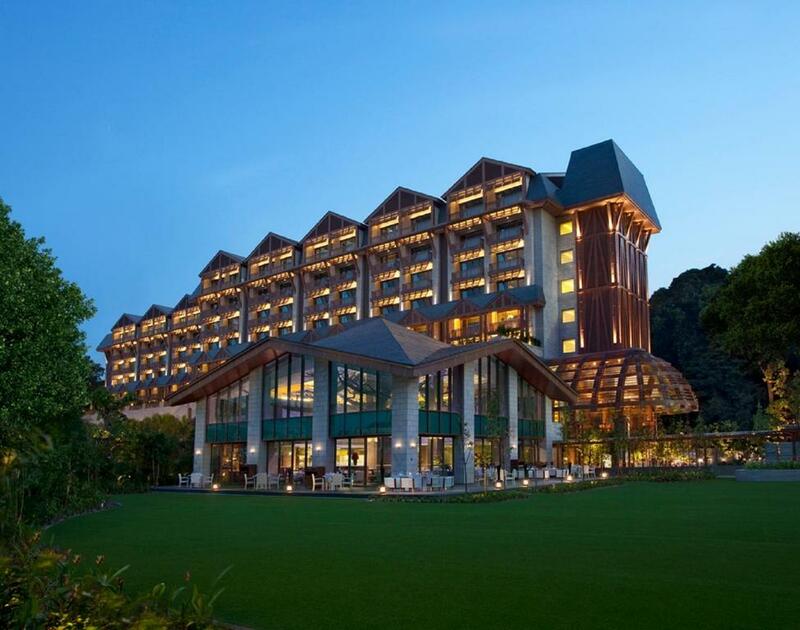 Located within Resorts World Sentosa, the luxurious Equarius Hotel provides spacious air-conditioned guestrooms with an iHome system and private balcony. 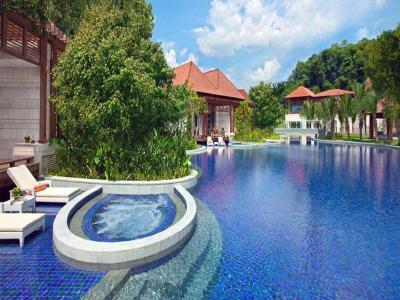 It also has an outdoor pool, a gym and pampering spa treatments. Decorated in calming neutral tones, all rooms are equipped with a flat-screen cable TV featuring international channels, a Simmons bed and premium 400-thread-count Egyptian cotton bed linens. A fully stocked mini-bar, free bottled water and tea/coffee making facilities are included. Chinese tea is available upon request. 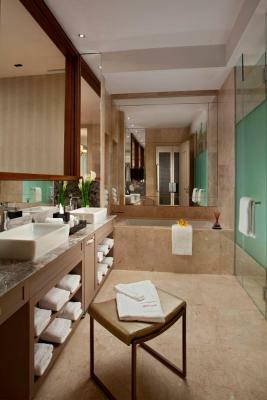 Private bathrooms have separate bathtub and shower facilities. Free toiletries include a toothbrush/toothpaste set. Bedroom slippers are provided. 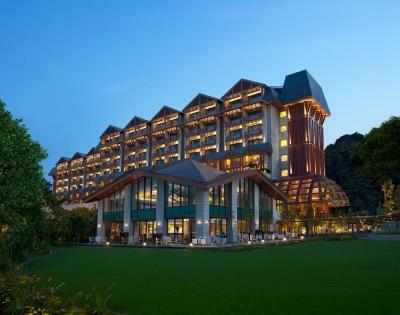 Guests can approach the 24-hour front desk for concierge services or to request for Chinese newspapers. Staff are able to converse in English and Mandarin. The exclusive ESPA features relaxing body massage and facials. The hotel also provides dry cleaning and laundry services. Forest Restaurant serves à la carte Chinese fusion cuisine in a stylish setting. Room service is available 24 hours. 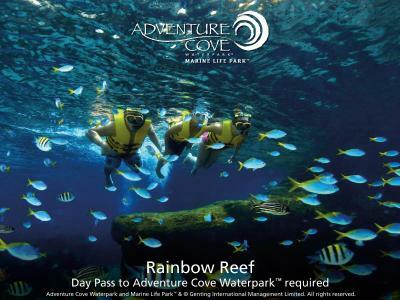 The world's largest sea aquarium, Adventure Cove Waterpark, Resorts World Convention Center, Universal Studios Singapore and the casino are all located within Resorts World Sentosa, just a 7-minute walk from Equarius Hotel. 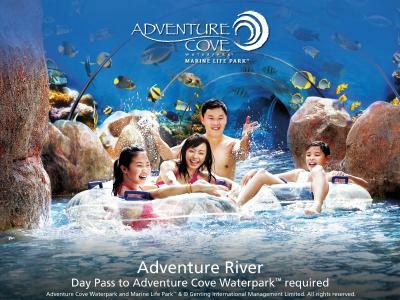 Vivocity Shopping Mall is a 5-minute drive away, while Changi International Airport is within a 25-minute drive away. 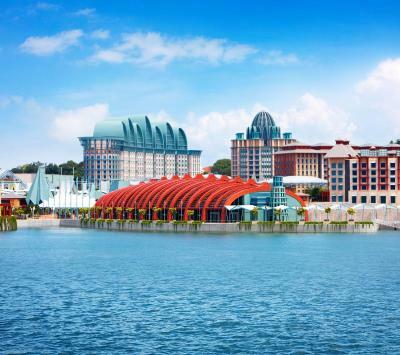 When would you like to stay at Resorts World Sentosa - Equarius Hotel? 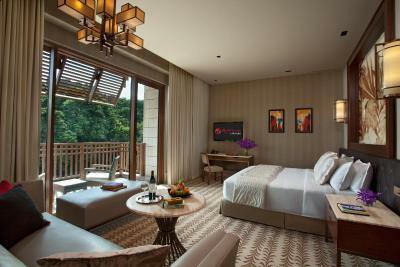 This spacious and luxurious air-conditioned room features a private balcony, an LED TV, an iHome system and a mini-bar. The private bathroom has a separate shower and a bathtub. Fitted with a private balcony, this spacious and luxurious air-conditioned room features an LED TV, an iHome system and mini-bar. The private bathroom has a separate shower and bathtub. Package entitlement is only valid for a maximum of up to 2 nights stay regardless of number of night reserved. Remainder of stay will only include the room. ** Treatments are not recommended for pregnant ladies. This twin/double room features a balcony, iPod dock and bathrobe. This twin/double room has a balcony, iPod dock and bathrobe. This twin/double room features a iPod dock, mini-bar and bathrobe. This twin/double room has a balcony, bathrobe and iPod dock. Nestled in a haven of greenery, Equarius Hotel promises a tranquil and pampering stay with breezy and spacious rooms and suites matched by equally spacious bathrooms. Every detail is designed with your comfort in mind, coupled with service of the highest standards. 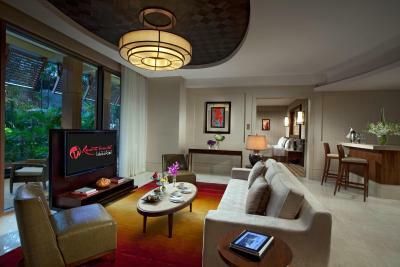 House Rules Resorts World Sentosa - Equarius Hotel takes special requests – add in the next step! Resorts World Sentosa - Equarius Hotel accepts these cards and reserves the right to temporarily hold an amount prior to arrival. The breakfast though good, the spread can be extended to include hot soup and baked potatoes. The live station eggs are great and the fried chicken stripes are addictive. The pastries are not tasty at all and should be improved. I like that it is in a quiet and peaceful area away from the busloads of tourists and crowd. The room and bathrooms are big and clean by any international standard. I love the ice and water dispenser on each level which are luxury items I look forward to at the end of each hot and humid day. The baby cot is essentially a metal playpen. It was very deep so I eventually co sleep with my son. Checkout was also really early at 11am. Would've been nicer to get a checkout at 12pm instead so we wouldn't be rushing so much. The room was really spacious and I like the balcony. The tv channel selection is also great. Another bonus is that the hotel is very environmentally concious, they provide you with a tumbler that you can refill instead of plastic bottles. Great effort by the hotel. The two tap waters in the bahtroom of our suite room were very slow that we washed our face in the kitchen area instead because the water was more. The air-conditioning in the bedroom was always cold. The living room was OK.
Quiet, peaceful location. We could buy attraction tickets at the concierge which was fast and convenient. 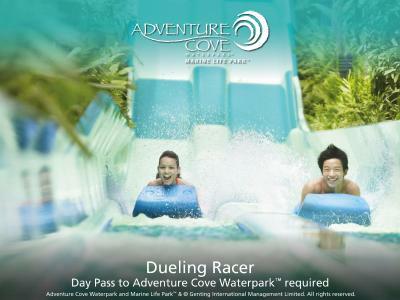 Back hotel door connects to Adventure Cove water park. Housekeeping was not as per standard, No choice of Muslim food at the property. Staff was friendly and supportive. Shuttle bus service. We mostly have to wait 10-15 minutes the bus not accurate like in Japan. Shampoo and body was not good of quality. There is no shattaf in the bathroom and towels are bit old. Counter staft not so friendly. Water supply by hotel was not bottle water have to refill fr outside room. Pool was quite distance away fr hotel. Great place, great location and wonderful ambience. The garden facing room with balcony was amazing. The view was fantastic. Didn’t feel like we were in Singapore.